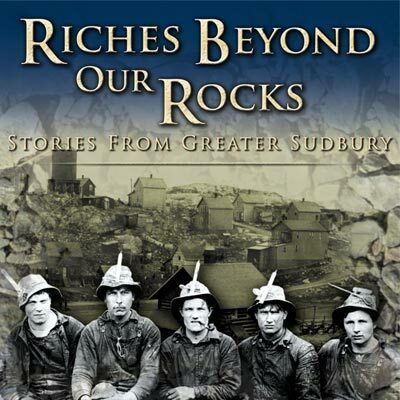 The story of the City of Greater Sudbury is as diverse and rich as the rocks beneath its surface; and the roots of its people run just as deep. For centuries the riches of the Sudbury landscape have attracted peoples from throughout Canada and the world. The Anishinabek, lumbermen, prospectors, miners, and farmers are among the pioneering spirits who have called Greater Sudbury home. Here, through its multicultural population and industrial endeavors, the echoes of the great moments of the 20th century can be heard. In 1883, as wife of the CPR doctor, Florence Howey was amongst the first to settle in Sudbury. As the town grew, so did the rumours of the potential wealth hidden in the area’s rocks. The Anishinabek people were the first to occupy the Sudbury area. The creation story of the blueberry helps us to explore the traditional lifestyles and practices of the area’s first peoples. Traditional territories are discussed as fur traders and miners are introduced to the north. The Royal Proclamation of 1763 and the Huron-Robinson treaty were developed to clarify these new relationships. In the 1850’s, Salter was sent to complete a survey North of Lake Huron. He noticed a strong magnetic deviation (a sure sign of metals in the rocks) on the edge of what would later be known as The Sudbury Basin. But for the time being, the pending arrival of the Canadian Pacific Railway proved to be of greater significance, in an age when the only route to the area was through primeval wilderness. The rail would become the source of much immigration to Sudbury. The end of 1883 saw the arrival of the CPR in the town of Sudbury. While the presence of the Jesuits helped to keep the town on the straight and narrow, smuggled in liquor proved tempting for the labourers. When the CPR construction centre moved from Sudbury, those who stayed behind turned to lumbering and farming for employment. About 1.8 billion years ago a meteor hit the earth creating a massive crater that would come to be known as the Sudbury Basin. The mineral rich ore of the Basin was a direct result of the impact. With the new railway running right through Sudbury, prospectors and businessmen flocked to the area. Aenaes McCharles and Samuel Ritchie were among the countless men who came to look for riches in the rocks. In 1885, Samuel Ritchie began buying up properties around the basin in hopes of mining copper. From these purchases the Canadian Copper Company was born. the valuable copper. For Ritchie, the search was on for new markets, methods, and partnerships to deal with the Canadian Copper Company’s mounting piles of nickel. The International Nickel Company was born out of this era. on a tour of early mining practices in the Basin. The large number of immigrants prompted the development of ethnic communities around the area’s mines. Area labourers often hoped for better lives for their children. The Collège Sacré-Coeur and railway school cars offered education and opportunity for aspiring youth. Churches, halls, and sports teams also evolved to improve the quality of life in company towns. The Sulphur Dioxide produced from roast yards and smelting facilities was deadly for plant life and resulted in the acidification of soils and lakes. A barren landscape was the price that Sudburians paid for good jobs and quality nickel products. Located just beyond the fumes of the roast yards, the nutrient rich soils of the Valley were able to produce prize-winning produce, most notably potatoes - in spite of the sulphur that hung over most of the region. While the acidification of the soil was fatal for most plants, the blueberry thrived and produced bumper crops during the roast bed era. Chapter 13 – Strengthening Sudbury The Spanish-American War and World War I were a boon for nickel producers as armaments were made stronger by nickel steel. While INCO absorbed one of its larger competitors and elected to become more Canadian to avoid American anti-trust laws, a new company, Falconbridge, began mining the basin on one of Thomas Edison’s old claims. From varying ideologies in the ethnic communities, tensions arose between those who supported either socialist or capitalist ideologies, or the ‘reds’ and the ‘whites.’ The socialist impulse, worker safety, and wage equality prompted the push to create unions for miners. Chapter 15 – Politics Underground Kit Coleman and Queen Elizabeth were among the few women who had been underground prior to the 1970’s. In spite of women occupying the work force during WWII, the mining act prohibited women from working in the mines. In 1944, the Mine Mill union was brought in at both INCO and Falconbridge, ensuring for men at least, fair wages and safe working conditions. Chapter 16 – The New Nickel Nickel boomed in the 1950’s, as did the city of Sudbury. The Leo May lunch box was a product of this era. In the following decade, The Big Nickel, created by Ted Szilva, celebrated the mineral that had ensured Sudbury’s success. Cold War stock piling proved beneficial for Sudbury, which was producing more nickel than ever and continued to attract workers from around the globe. Communist propaganda was used to heighten tensions between competing unions and resulted in workers having to choose between Mine Mill and the United Steelworkers. The 1960’s saw the development of new services in Sudbury, including the establishment of Laurentian University. The university drew a number of scientists to the city who had hopes of reclaiming the barren landscape. Plant life, lakes, and soils had been severely damaged by decades of pollution and it would take industry, the municipality, and volunteers to bring them back. The construction of Science North and the success of city re-greening programs harkened a new era for Sudbury – a city at the forefront of science and technology in the mining and environmental sectors.